As with many other topics about which we have been having a little chat, a complete volume could be written about the Watton railway, the old "Crab and Winkle", but for the lime being it must suffice to record that it came, it stayed a little while, and "then, there it was gone" as an Irishman with a Norfolk accent might say. The L.N.E.R. branch line from Thetford to Swaffham was opened in 1869, and was still a busy, important element in the life of the town during the I920's, but was heading for decline by the 1930's. When the full service was running there were five trains a day to Thetford, and five to Swaffham and one daily goods train. The goods traffic was probably at its peak between 1920 and 1930. Thousands of tons of sugar beet from local farms were sent to Bury St. Edmunds sugar factory and there was extensive traffic in coal, corn, fertilizers feeding stuffs and. sometimes, livestock. 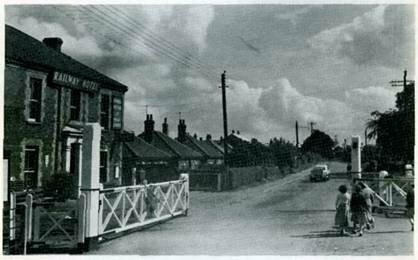 Most of the stocks and supplies for Watton shops came by train and were delivered to their final destination by cheerful Ted Greaves with his L.N.E.R. wagon, and sturdy horse. This horse needed no driving because he had been on the rounds so many times he knew his way about as well as Ted did.